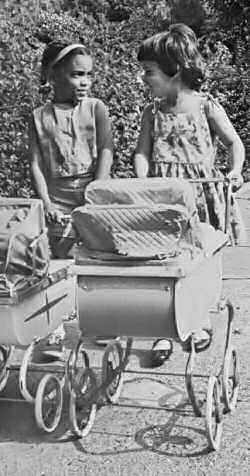 Cris Branche moved to Albion Road in 1956, less than one year after the first black family moved to Ludlow. That same year, a bomb exploded in a resident's garage and "For Sale" signs began to sprout like weeds through the 500-home community just east of Shaker Square. Thirty years old and pregnant with her first son, Branche was not expecting to become a suburban pioneer. "We didn't have the sense to know yet that that was a big deal," Branche told the audience at the Ludlow Community Association's 50th anniversary celebration earlier this month. "We just needed to find a bigger house." The house that she found was the only one on the entire street that was not subject to the restrictive Van Sweringern covenants that required black families to get the signatures of all their neighbors before they could buy. And it was a filthy house, Branche recalled, with ropes of dirt hanging from the ceiling like fuzzy snakes, but she was not afraid of a little work. 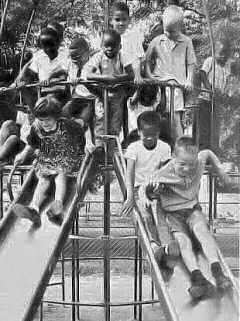 Nor was she intimidated by being one of the first black families in town. "Just get us the house and we'll take care of the people," she thought. Ron Spetrino, standing facing left, hosts a meeting of the Ludlow Community Association in his Onaway Road home. This photograph comes from a brichure entitled "Cosmopolitan Pioneers" produced in the mid 1960s. In exchange for a cool glass of water, her new mailman told her the news folks down the street were meeting in secret to discuss their new neighbors. But out of the violence, the fear and the new danger known as "blockbusting" the Ludlow Community Association was born. 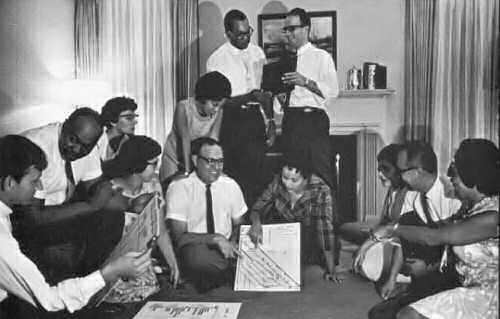 Formed in 1957 in a bold attempt to stabilize their neighborhood through inclusiveness and balance, the association became a national success story in integration. Together, black and white families agreed that if they could get white families to buy in Ludlow, they could combat the rumors that the community was turning into a ghetto. When real estate companies told them it was a lost cause, they sold bonds and raised money to help families with high down payments. When people said it couldn't be done, they simply worked harder and met more frequently. Between the fall of 1964 and the spring of 1967 the residents of Ludlow raised $30,000 from three fundraisers alone. Past president Ron Spetrino, another speaker at the Sept. 8 anniversary event, was the mastermind behind LCA's biggest fundraising efforts. In the fall of 1964 the association bought out the entire Shaker Square theater for the opening night of "My Fair Lady." They sold out the theater, raised $5,000, and at least 25 percent of the entire community was involved in selling the tickets. In 1982, on LCA's 25th anniversary, Ludlow Elementary School was perfectly balanced with 50 percent black students and 50 percent white students. "At that point the community was intoxicated by its own success," Spetrino said. "And LCA was growing in stature to both its residents and to the greater Cleveland community as both a viable and valid organization working for integrated housing." Another past president, Alan Gressel, came to Ludlow in 1960 and ran the housing program until the city took it over in 1967. He never made a commission from a home that he sold. "The important thing to understand about the housing program is that what we were selling was not the house. We were selling the community," Gressel said. "Selling the community meant selling the school. It meant selling the idea of integration." And even during the bitter closing of Ludlow School in 1987, the LCA stayed strong and supported the school board's difficult decision. Ludlow resident Carolyn Milter, another anniversary speaker, served on the school board when the choice was made. "It hurt then, and it still hurts 20 years later that I voted to close Ludlow School," Milter said, close to tears. "But how proud I am that LCA supported that decision." For the many who remember Ludlow's hardest days, the 50th anniversary was an emotional gathering. But for the current co-presidents, 2007 is also the time to talk about the future of this once vibrant organization. When Dr. Tom Chelimsky moved into Ludlow, he knew nothing of his neighborhood's rich history. Now, as an LCA co-president since 2002, he's hoping to rekindle the Ludlow spirit toward a new model the intergenerational community. "The neighborhood becomes what you dream it," Chelimsky said. "This community would be one where I, at least, would spend the rest of my days." Cris Branche knows exactly what he means. "I am 80 years old and I am grateful to be upright and still living in the same house," she said. © 2007 The Sun Press - Sun News Used with permission. To read this story of the Sun-Press website, click here. Contact Catanese at marie.catanese@yahoo.com or (216) 986-5865.